Renowned Italian automotive manufacturer Beta Utensili has been unveiled as the new title sponsor of the Motorsport Ireland Awards. Beta has a distinguished history in motorsport throughout the world. In 1975, the company’s pioneering sponsorship in Formula One was rewarded when Vittorio Brambilla took an historic victory at the Austrian Grand Prix, driving at the wheel of the very distinct orange ‘Beta Utensili’ liveried car. From that day Beta and motorsport became inseparable. Martin Bryers, Beta Head of Sales, UK and Ireland, said: “In association with our partners in Ireland, J&S Automotive, Beta are delighted to sponsor the Motorsport Ireland Awards and to be involved with Irish Motorsport. The Motorsport Ireland Awards will be held in Mansion House on December 5th. Among the prestigious prizes up for grabs are the International Driver of the Year, the Sexton Trophy, and the Billy Coleman Award for the young rally driver of the year. Drivers who have already secured nominations for this year’s awards due to their performances behind the wheel include Charlie Eastwood, from Co Antrim; Conor Farrell, from Dublin; James Roe, from Co Kildare; Jordan Dempsey, from Co Westmeath;Michael Boyle and Kevin Eves, both from Co Donegal; and Jonny Treanor, from Co Monaghan. Other nominees will be added as the motorsport season draws to a close over the next two months. Previous winners at the Motorsport Ireland Awards include Craig Breen, now competing in the World Rally Championship; Keith Cronin, a four-time winner of the British Rally Championships; and former European Rally Cross Champion and Irish title holder Derek Tohill to name but a few. 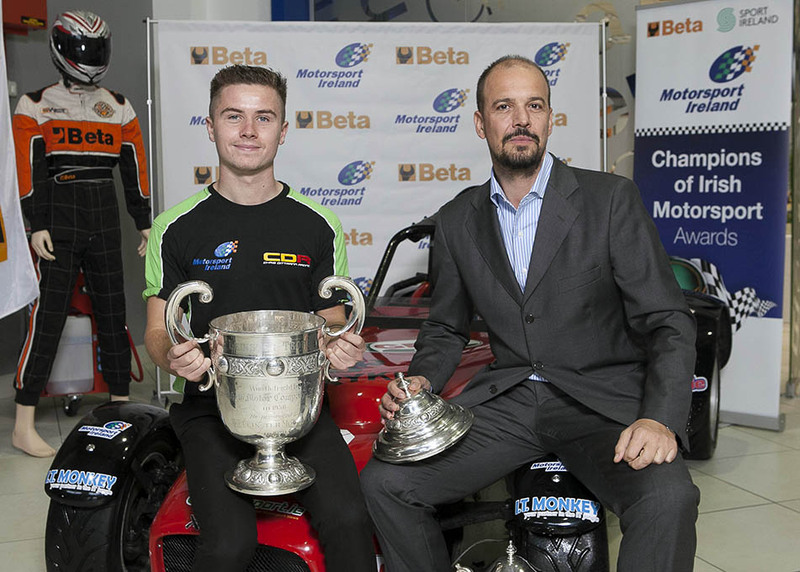 Meanwhile, up -and-coming motor-racing star Cian Carey has spoken about his “incredible season” since winning Ireland’s Young Racing Driver of the Year award last December. Carey, from Co Meath, was speaking at the announcement by Motorsport Ireland that the renowned Italian automotive manufacturer Beta Utensili has come on board as the new title sponsor of their prestigious motorsport awards. Carey, who is racing in Formula Three in the UK and recently won the internationally-acclaimed Leinster Trophy, said: “Winning the Sexton Trophy for young racing driver of the year is definitely one of the highlights of my career to date. It has opened so many doors that would normally be shut and has, without doubt, helped me to progress in my sport.